Thankfully, both of these use cases can be addressed by this handy website. To get a full list of all the possible categories that Websense can be configured to block, simply visit testdatabasewebsense.com. 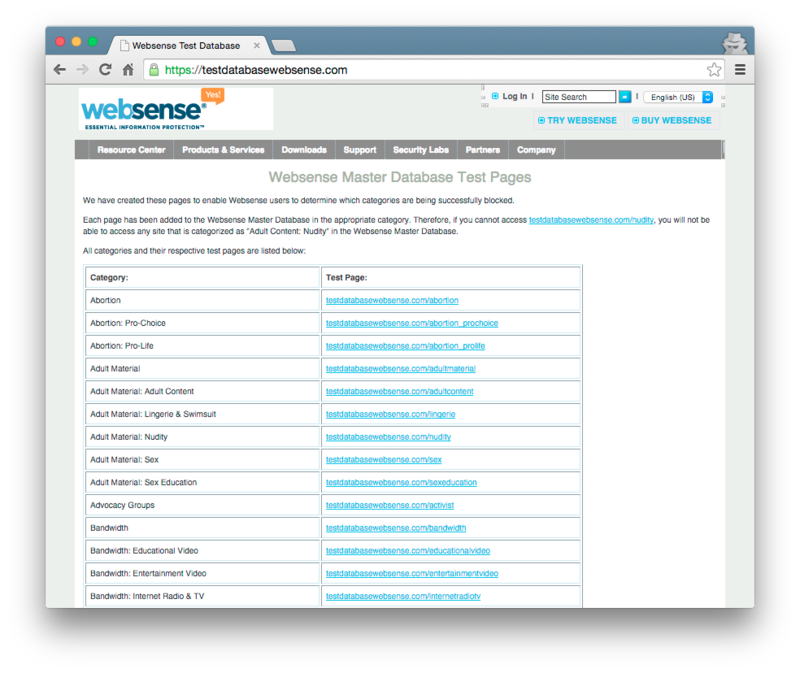 Here you will find a list of test URLs that are categorized in Websense’s database. If Websense is filtering your traffic, you won’t be able to visit the URL corresponding to categories blocked by your internet connection. It’s important to note, for those looking to get around Websense, that just because you can get to a website doesn’t necessarily mean that your internet connection isn’t being monitored. If you are concerned about online privacy, there are better ways to connect to the internet than by just hoping that your traffic isn’t being filtered. Some of these techniques as well as the complications they pose to IT professionals will be addressed here soon.